"Sights" redirects here. For the rock band, see The Sights. A sight is an aiming device used to assist in visually aligning ranged weapons, surveying instruments or optical illumination equipments with the intended target. Sights can be a simple set or system of markers that have to be aligned together with the target (such as iron sights on firearms), or optical devices that allow the user to see a sometimes optically enhanced (e.g. magnified) image of the target aligned in the same focus with an aiming point (e.g. telescopic sights, reflector sights and holographic sights). There are also sights that project an aiming point (or a "hot spot") onto the target itself, such as laser sights and infrared illuminators on some night vision devices. At its simplest, a sight typically has two components, front and rear aiming pieces that have to be lined up. Sights such as this can be found on many types of devices including weapons, surveying and measuring instruments, and navigational tools. 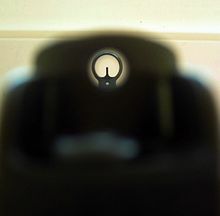 On weapons, these sights are usually formed by rugged metal parts, giving them the name "iron sights", as distinct from optical or computing sights. On many types of weapons they are built-in and may be fixed, adjustable, or marked for elevation, windage, target speed, etc. They are also classified in forms of notch (open sight) or aperture (closed sight). These types of sights can require considerable experience and skill, as the user has to hold proper eye position and simultaneously focus on the rear sight, the front sight, and a target, all at different distances, and align all three planes of focus. Optical sights use optics that give the user an image of an aligned aiming point or pattern (also called a reticle) superimposed at the same focus as the target. A telescopic sight is an optical telescope equipped with some form of graphic image pattern reticle mounted in an optically appropriate position in the optical system to give an accurate aiming point. Telescopic sights are used on a wide range of devices including guns, surveying equipment, and even as sights on larger telescopes (called a finderscope). Another type of optical sight is the reflector (or "reflex") sight, a generally non-magnifying optical device that allows the user to look through a glass element and see a reflection of an illuminated aiming point or some other image superimposed on the field of view. These sights have been around for over 100 years and have been used on all types of weapons and devices. Reflector sights were first used as a weapon sight in German aircraft towards the end of World War I. Over the years they became more sophisticated, adding lead computing gyroscopes and electronics (the World War II Gyro gunsight) radar range finding and other flight information in the 1950s and 60s, eventually becoming the modern head-up display. There are many types of sighting devices. They can be fixed, mechanical, optical, computational, or a mixture of all of these attributes. ^ a b Patrick Sweeney (2004). Gunsmithing – Pistols & Revolvers. Krause Publications. p. 185. ISBN 978-0-87349-763-3. ^ Richard Bowyer (1999). Dictionary of Military Terms. Taylor & Francis. p. 178. ISBN 978-1-57958-156-5. ^ Dan Shideler (2010). Gun Digest 2011. F+W Media. p. 148. ISBN 978-1-4402-1561-2. ^ Elementary Optics and Application to Fire Control Instruments. Headquarters, Department of the Army. 1977. pp. 8–27, 8–28. Wikimedia Commons has media related to Gunsights. This page was last edited on 12 January 2019, at 10:12 (UTC).